The Kingdom of France goes back to the 5th century when the Merovigian Kings of the Franks conquer the Roman province of Gaul and giving it their name. The Franks had started settling into the northern Roman area of Toxandria at the end of the 3rd century. The Merovingian Dynasty ended in 751 when Pippin the Short, the first Carolingian, was crowned King of the Franks. The Carolinghian Dynasty died out in 987 with Louis V and nobleman Hugues Capet was chosen as successor. His eldest certain ancestor is Robert le Fort, margrave of Neustria (+ 866), probably a descendant through the counts of Hesbaye of another Robert who was dux in Neustria between 654-677. 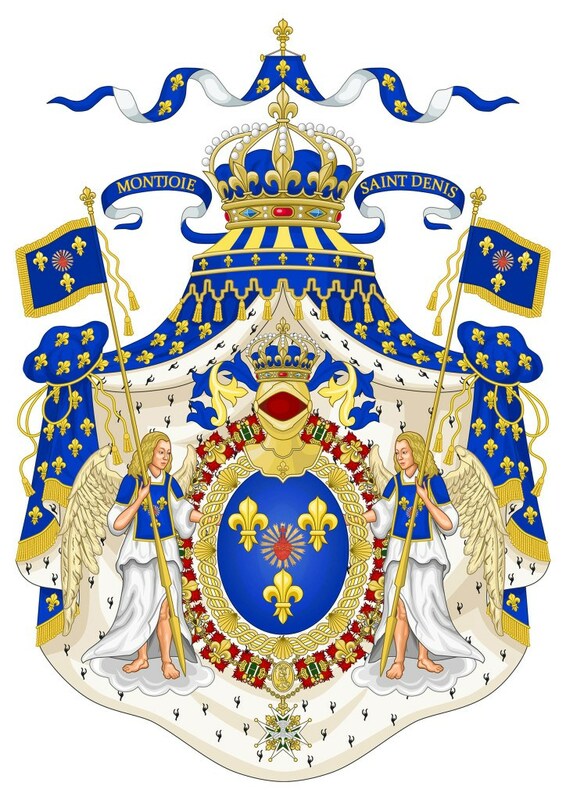 The main direct line of the House of Capet died out with Charles IV le Bel (1294-1328), after which his cousin the Count of Valois acceded the throne as Philippe VI. His line died out with Charles VIII l'Affable (1470-1498) and a second cousin of his father, the Duke of Orléans acceded the throne as Louis XII (1462-1515), who was followed by the son of his cousin François I (1494-1547), whose line died out in 1589. The closest male heir was the Duke of Vendôme, Henri de Bourbon (1553-1610) a descendent of King Louis IX. He had succeeded already in 1572 his mother, Jeanne III d'Albret, as King of Navarra. In 1589 he became as well King of France as Henri IV. His descendant Louis XVI was deposed in 1792. 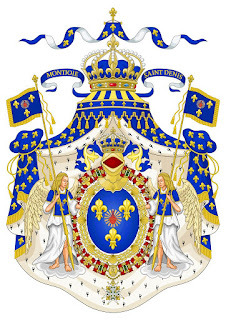 The direct line of the Kings of France died out in 1883. The present French royal family descends from a younger son of King Louis XIII, the successor of Henri IV, Philippe Duc d'Orléans. His descendant Louis Philippe Duc d'Orleáns (1773-1850) was King of the French from 1830 to 1848. 68. Ferdinand Philippe Louis Charles Henri Rosolin Prins van Orléans, Duc d'Orléans * Palermo 3-9-1810 + Sablonville 13-7-1842; Zn van Louis Philippe Koning der Fransen en Maria Amalia Prinses van Napels en Sicilië = 64. 69. Helene Hertogin van Mecklenburg-Schwerin * Ludwigslust 24-1-1814 + Richmond, Surrey 18-5-1858; Dr van Friedrich Ludwig Erfgroothertog van M.-S. en Caroline Prinses van Saksen-Weimar-Eisenach = 65. 92. Ferdinando II Carlo Koning der Beide Siciliën * Palermo 12-1-1810 + Caserta 22-5-1859; Zn van Francesco I Koning der Beide S. en Maria Isabella Infante van Spanje = 86. 93. Maria Theresia Aartshertogin van Oostenrijk * Wenen 31-7-1816 + Albano 8-8-1867; Dr van Karl Aartshertog van O. en Henriëtte Prinses van Nassau-Weilburg = 87. 124. N. v. Michalkowski * ... + ...; Zn van Felix v. M.